From OUTDATED gaudy gold to UPDATED shabby chic! 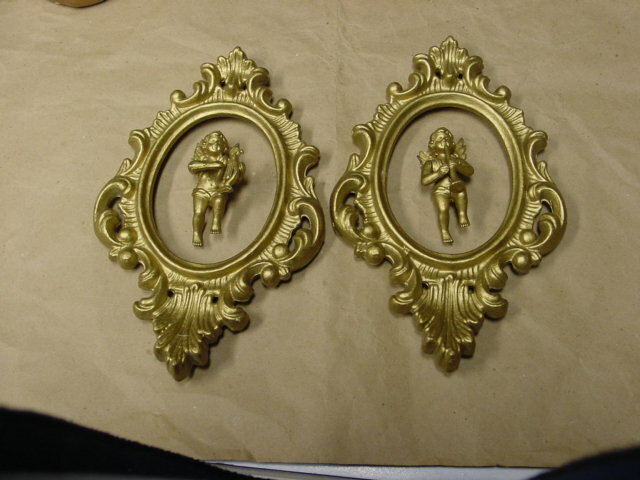 I lost the original picture of these little framed cherubs. (bought them quite some time ago!) They were on a bright turquoise velvet backing in the frames. I took them apart right away, and stashed them in my ‘Valentine stuff’ supply box until I was ready to work on Valentine stuff! 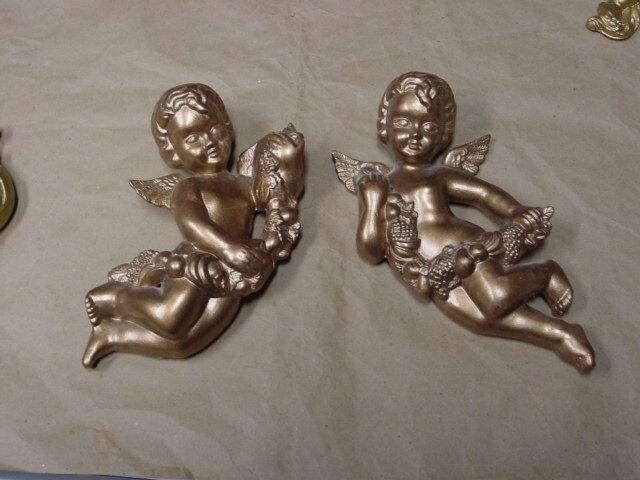 I also had these, shown as purchased; ceramic and painted gold. 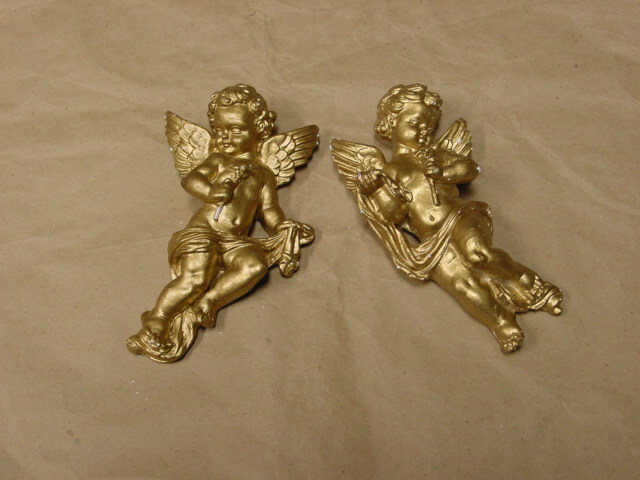 And these, cast plaster painted gold. 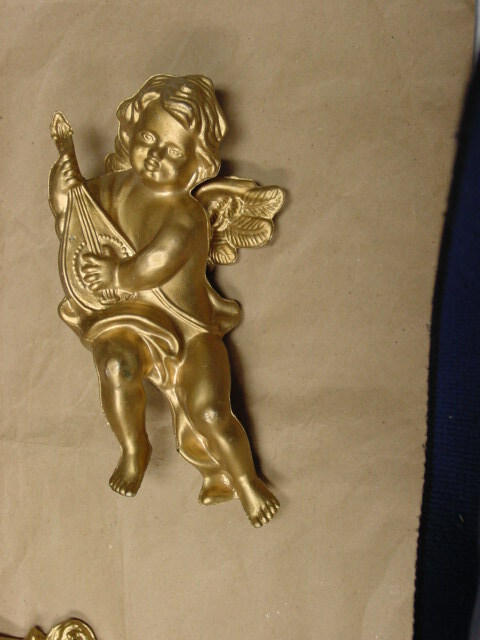 And this single one, plastic painted gold. NOW, what to do with all that gold and gaudiness?!?!? Paint them, of course! Spray paint would be my first choice for items as intricate as these. But being in the midst of monsoon season here in Oregon is prohibitive to outdoor painting. So plan B is use craft paints. More coats required and more time consuming, but it gets the job done! 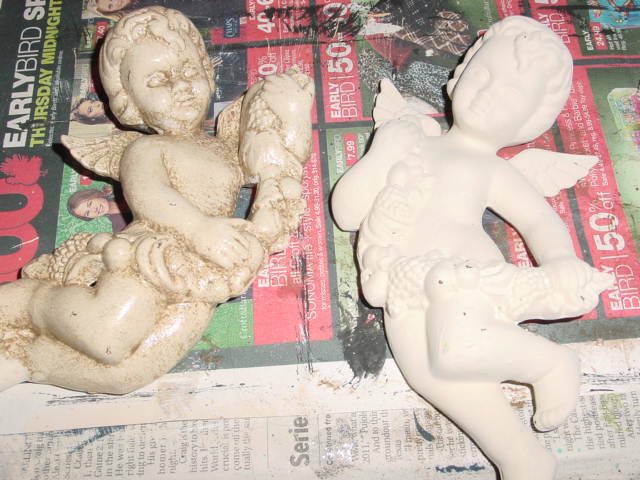 MY flash went off in the above photo and washed it out a bit, but you can see how I painted them an off white before ‘glazing’ them. 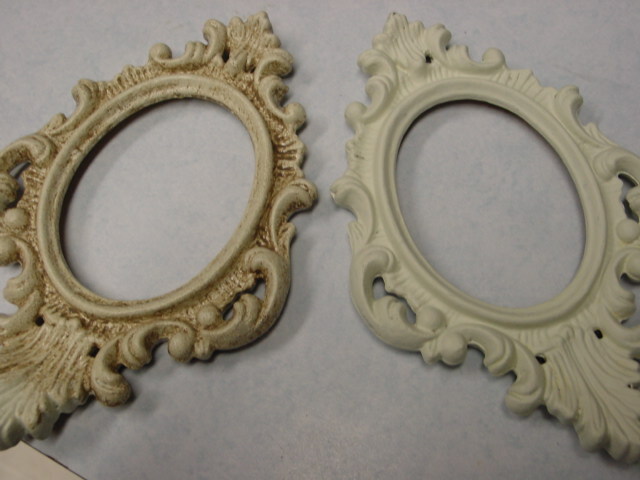 Did all of them with the same treatment; off white paint, then Ralph Lauren tobacco glaze. GLAZING: First, generously apply the glaze, being sure to get it onto all the nooks and crannies. I really just SLOP it on! Then I ‘stipple’ over the entire surface to remove some of the excess AND even it out over the entire surface. Then with a rag (I prefer CLOTH to paper towels; old socks work great!) gently dab over the entire surface. 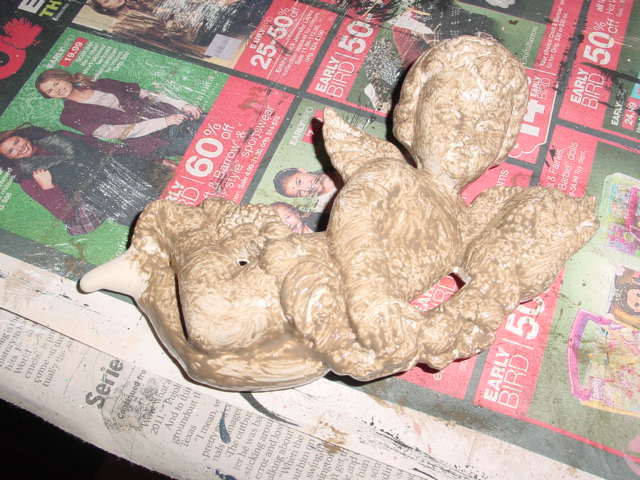 This is where you create the contrast, leaving more glaze in the detail areas. And now another look at the before and after glazing. A couple more glazing tips: work quickly, it dries fairly fast. If you look closely you can see that foot on the left is NOT glazed, YET! Leave yourself something to hold on to. Go back and glaze that after the whole thing dries. Once the glaze is dry, it’s permanent! So it’s better to remove too MUCH, as opposed to too little. You can always go back and add more if you need to. 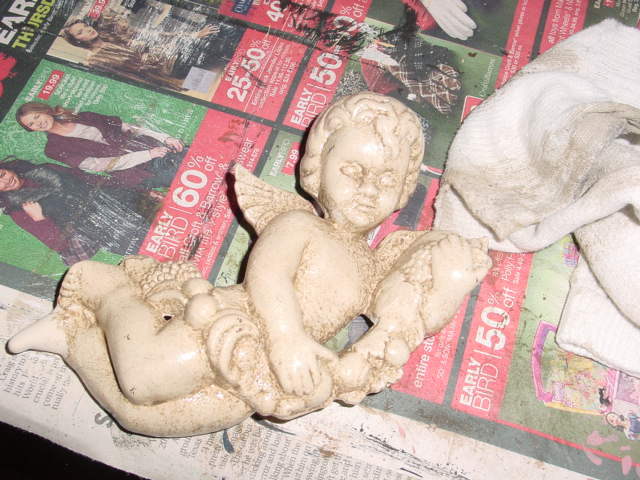 And then you have to figure out what to DO with your shabby chic cherubs. 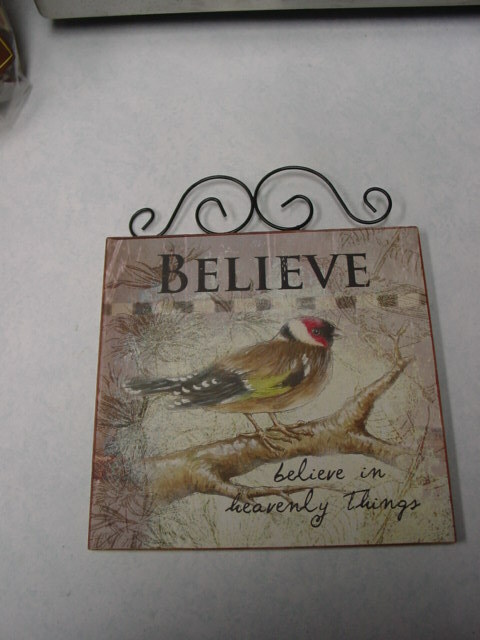 I started rummaging through my stash of frames and happened upon these plaques from Dollar Tree; which I bought mostly because I liked the scroll on top, and intended to use for making collages. 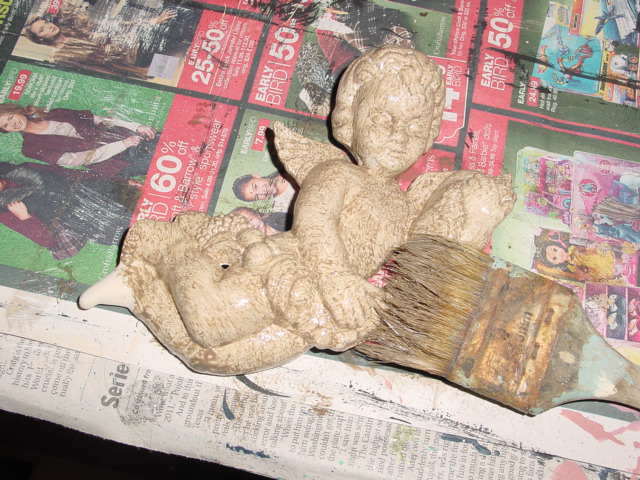 So, I positioned one of the cherubs on the plaque to see if I liked the proportions before I started looking for new background paper. HEY!!! 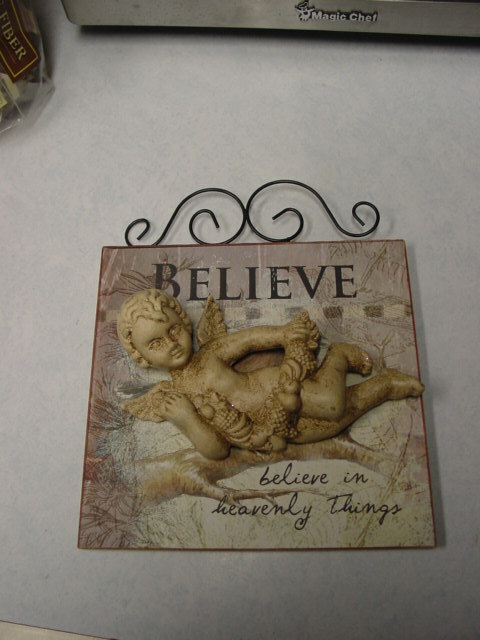 The cherub covers up the bird, AND the ‘BELIEVE’ saying works with the cherub theme!! Where’s my glue??? I did both of that set on the DT plaques. Then, after looking at them while the glue dried I decided it needed a little something more, crowns! NOW they’re really done! 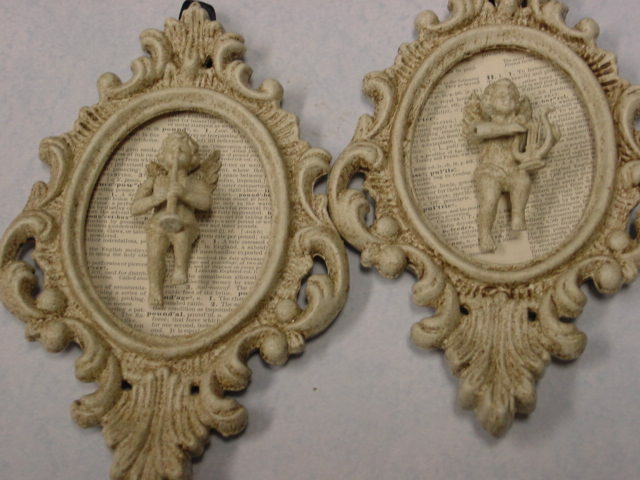 And the tiny cherubs with the frames just got a new backing (old dictionary pages) and glued back into their original frames. I thought about using vintage sheet music on these, especially since they are playing instruments. But the music pages were too big and bold of a pattern, and I wanted a more muted back ground. I stayed away from Valentine specific colors/wording on these; so they are something that can be used year round. 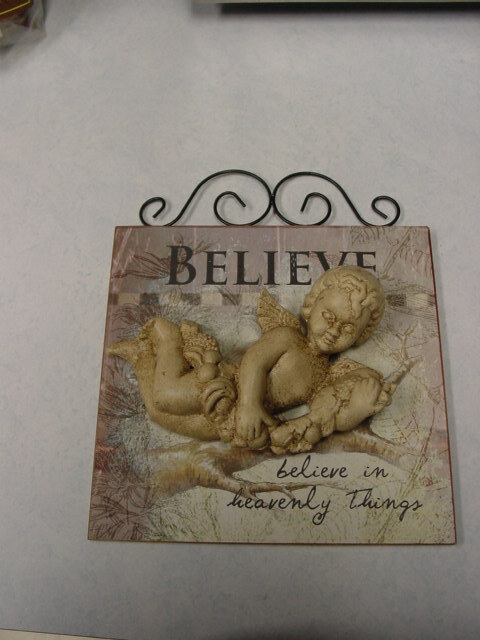 The small oval framed cherubs will be going into my etsy shop soon. The bigger plaques have gone to my space at Stars Antiques. Fantastic and so inspiring – as usual!!! love the fabric hearts. 2 questions; do you ship to Canada and how do I access your etsy store? 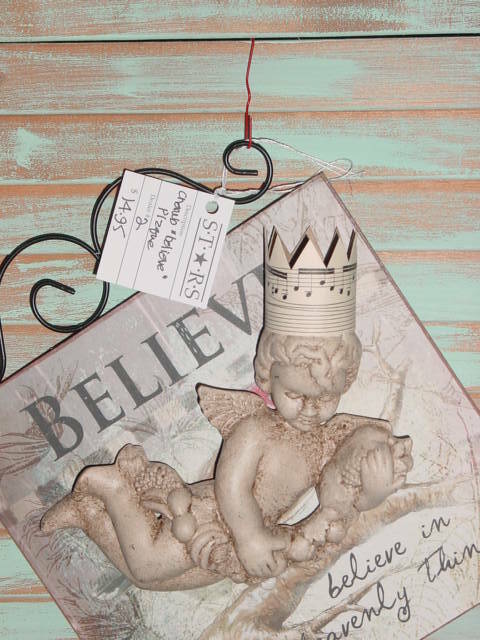 do you have a direct link to your etsy site? thanks. Please read under the heading of SHOP ANNOUNCEMENTS regarding shipping out of the US. So sad that this will be your last showing at EHN. I loved looking at your creations. I will miss you there as I have missed your brick and mortar shop. I am wondering about the pineapples shown above. I did not see them on etsy. Are they already gone? I love them!